Quilts There are 31 products. 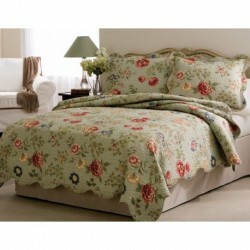 Flowering vines on a bed of sage green with detailed machine stitching and scalloped edges. Edens Garden is a classic quilt used in understated luxury. Cotton filled quilt featuring preppy plaid patterns in a printed face dominated by blue, khaki and burgundy. This value oriented pattern is a collection of pink and purple owls and pretty flowers. Baseballs, footballs, soccer balls and volleyballs all packed into this easy care sports quilt. Classic framed flowers in bright paste pink, purple, yellow and green. Tan and rusty red plaids serve as the background for classic lodge quilt.